I won’t say that “back in my day”, it was simply expected that you graduate from high school, but one got the sense that in generations prior, that’s how it was. You were supposed to graduate from high school. 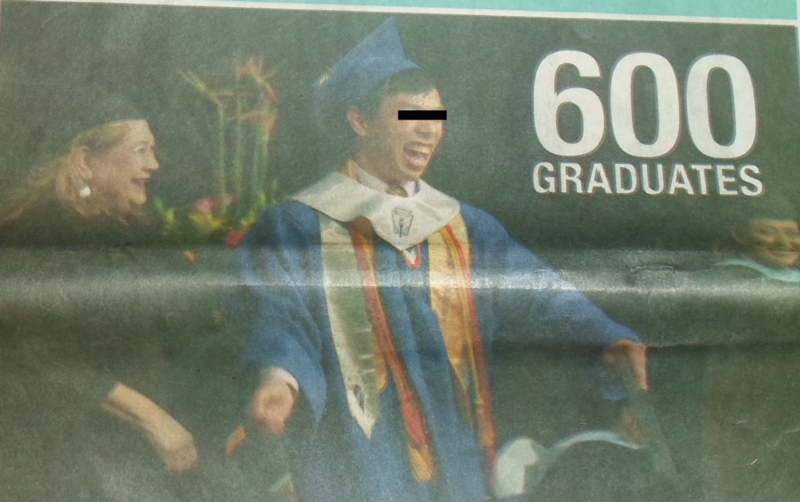 Now every school in my area takes out a full-page ad (some take out several pages of ads) trumpeting the unbelievable accomplishment of our high school students graduating from high school. In fact, if you stripped all the words and context away, these ads almost look like photos of people who just won the lottery! I strongly disagree with this approach. I refuse to participate in this cult of the high-school-graduation hysteria. It looks and feels like sliding standards. I’m skeptical that the world’s highest-performing countries do this. And sadly, it will be hard for individual schools to stop doing this, as long as all the other schools continue doing it. This form of peer pressure will tend to ensure this embarrassing trend continues going strong. One wonders what’s next. All-out celebrations for junior high graduates? Custom theme music getting blared out for students each time they successfully go to the restroom? To tell you the truth, I feel like the students here are pawns, at least partially, in an academia-led scheme to cult-ify high school graduation. Very similar to how we used to always hear the mind-boggling sage wisdom about how 18-year-old basketball phenoms should play four years of college basketball. While making $0 and risking a career-ending, millions-losing injury! With the only upside being that they get a college education… that they could have actually received later after they secured hundreds of millions of dollars (with tens of those millions being guaranteed in their initial contract, before they even stepped foot on the court).